I was chatting with my girl-friends the other day about mothers and mothers' day (which is this Sunday in Canada). Throughout the conversation, I kept remembering little stories about all the cute or funny things Lev has done lately. One of my friends exclaimed, "Now I get why people have kids! They're lots of fun!" It's true that some parts have been difficult, frustrating, exhausting, and even scary (especially when he started climbing things) - and he's only a year and a half! But I believe I have laughed more in that time than I have since I was a kid. 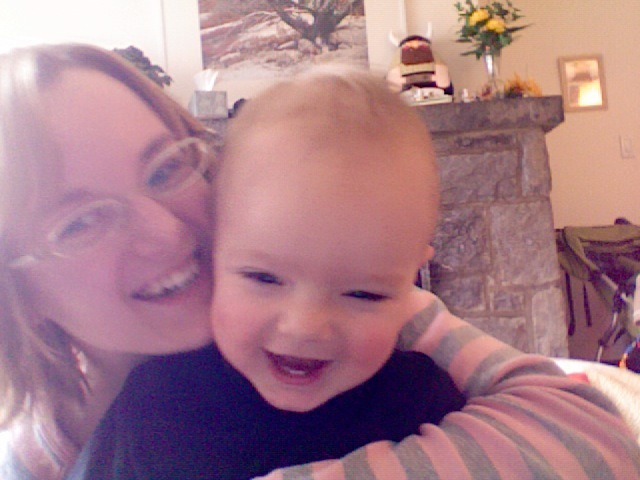 I love him to pieces, and I'm so lucky to be his Mama (or Mam, as he calls me). Reading with my mom. I'm in the purple PJ's, and about 6 years old. Sadly, I've forgotten to send my Mom anything, but hopefully a long phone-call will help. We don't talk as much as I'd like, since she works odd hours, and there's a 3 hour time difference between us. One of the things I love most about my Mom is all the things she taught me over the years. Reading first, then sewing and embroidery, plus cooking and baking. She was also my Girl Guide leader, and was always challenging me to learn more about all kinds of things there. I wish I'd nagged her more to teach me knitting, as I wonder how far ahead I would be with another 15-20 years experience, but at least it's now a hobby we can enjoy together. Taken with the camera on my laptop, about a month ago. We haven't made any plans to celebrate Mother's Day in our little family, but I think a trip to a greenhouse for plants to fill my flower boxes would be just right (wink wink). To continue my earlier story, I came home from visiting my friends, to discover Mr. Mitten working on a super special gift for me (he has a little talent that he doesn't practice enough). I was so surprised and overwhelmed I got a little teary. Maybe he'll let me share the drawing once he's finished. To celebrate Mothers everywhere, the things they teach us, and the laughter they share with us, I'm running a little give-away. 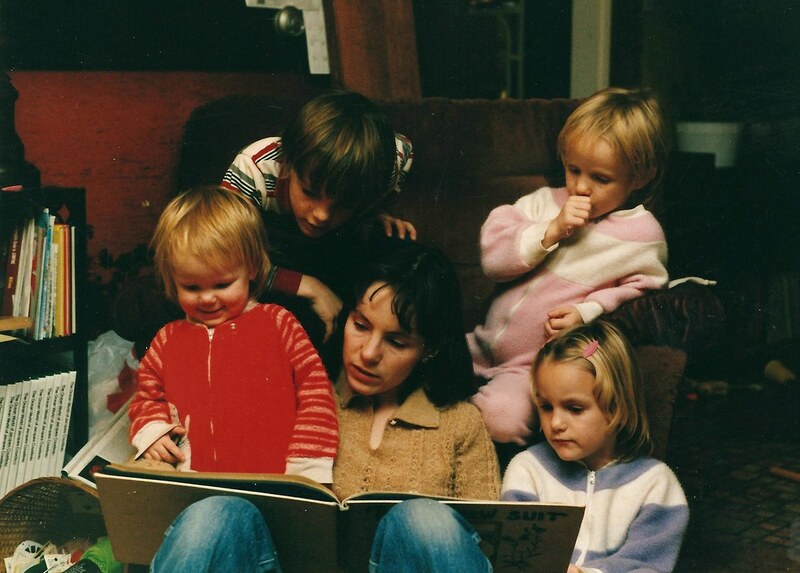 You just need to leave a brief comment sharing something you love about your Mother, or about being a Mother. On Sunday morning (May 9), I'll draw some names, and the winners will receive a free pattern of their choice*. It will help if you leave your email address or Ravelry name with your comment, but if you don't want to do that, check back here to see if you won. *If you happen to have all the patterns you'd like, I'd happily send the free pattern as a gift to whomever you choose. Posted by Barbara Prime at 7:27 a.m.
My Mom is a crafter... she makes beautiful quilts and quilted bags... for other people. If one of her children wants a bag or quilt, it will take her months... YEARS to finish it... where as, if someone casually mentions "Oh, so-and-so is having a baby!"... she'll have a quilt or bag whipped up for this person (sometimes it's someone she doesn't even know!) in a matter of hours! The INJUSTICE!!!! May 7, 2010 at 8:39 a.m.
May 7, 2010 at 9:44 a.m.
My mom is my very best friend. We can talk about absolutely anything and I tell her EVERYTHING. I have been living away from home for 4 months now and it's killing me. You really realise from afar how good you have it! I get to see her again in5 days and I'm really excited. May 7, 2010 at 10:27 a.m.
My mom is amazing - she raised all seven of us and is the most patient, laid back person I know. And as a new mom, I appreciate her more than ever before! May 7, 2010 at 10:44 a.m. I love that my mom homeschools/homeschooled all of nine of us kids. It's crazy sometimes, but so much fun being around family all the time! May 7, 2010 at 11:09 a.m.
May 7, 2010 at 11:11 a.m. So love your designs. 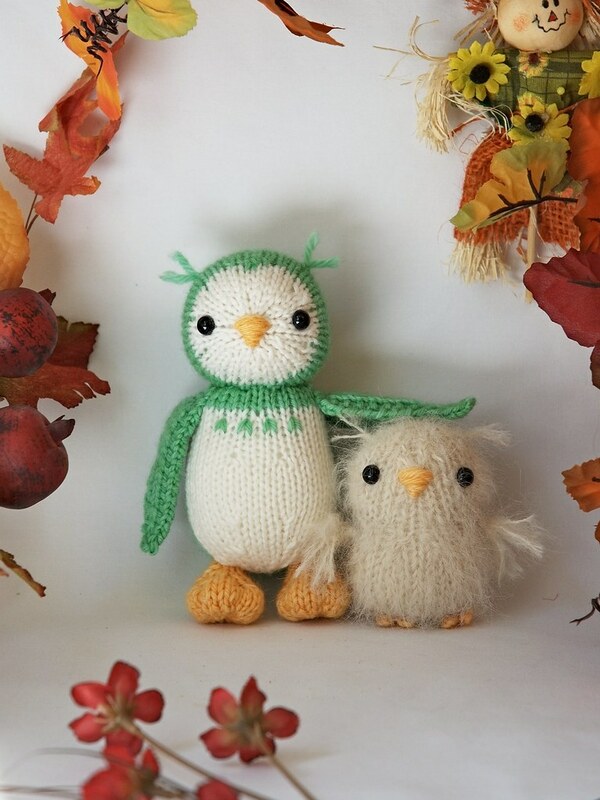 Wouldn't the little owls make a nice addition to a graduation gift?? May 7, 2010 at 11:47 a.m.
My dad passed away recently after a very, very long illness and I spent two weeks with my Mom. I had left my child with my husband and it was just the two of us with no one we had to tend to. We gardened, shopped, drank lemon drops, avoided cooking, and solved all the world's problems. May 7, 2010 at 11:54 a.m.
May 7, 2010 at 12:39 p.m. I would replace my Big Teddy w/ Overalls, as my pattern has really seen it's better days. It's my favorite baby gift to make and give. It lets me be so creative! Sadly, my Mom has passed. I remember her fondly every day and thank her frequently for my crafting skills. May 7, 2010 at 12:41 p.m.
My mom is def. my best friend. It took a while to get there, but that's because she was always my mother first, and my friend second. We both taught ourselves to knit at around the same time, and now we skype to show one another our projects. I would be lost without her! May 7, 2010 at 12:42 p.m.
What do I love best about being a mother--hmmm There's just so much. Holding their hands and seeing their smiles rank near the top. May 7, 2010 at 12:52 p.m.
What I love most about being a mother is how it made me rethink almost everything I ever thought about my own mother. How every mean-seeming or uncaring or unpopular decision that was SO UPSETTING TO ME ask a toddler/child/teen now has a million explanations yet not a single one that I could ever begin to explain to my own boys until they become parents as well. It's complex and hard and tough and crazy and I love it. Someone once said that becoming a parent means agreeing to walk around with your heart on the outside of your body, and they were right. p.s. that photo of the mama bird and chick makes me smile every time I see it- they are adorable! May 7, 2010 at 2:03 p.m. I love that my mom will listen to me complain about the most mundane things. As for being a mom, I love the morning snuggles from my 5 and 7 year olds...all the squabbles and stresses from the day before just melt away. May 7, 2010 at 2:47 p.m. I love everything about my mother. She's my best friend, and it kills me that she lives so far away, and I don't get to see her very often. We talk on the phone almost every day, though. She pretty much raised me by herself, and I always had everything that I wanted and needed. I've always been able to tell her anything, and I know she won't judge or think any less of me regardless of what it is. I was looking at old pictures the other day and it made me sort of sad, because I miss all of the fun times we had. I didn't mean for this comment to be so long, but I just love my mom so much that I couldn't help it! May 7, 2010 at 5:01 p.m.
May 7, 2010 at 6:12 p.m.
May 7, 2010 at 8:13 p.m. The thing I love most about being a mom is the hugs and kisses. When they come hop into bed in the morning with me and their Daddy with giggles and cuddles. The thing I love most about my mom is how she knows what I like so well. Everything she's ever picked out for me I've loved. And the best time our when we have girls' day out and go window shopping, have lunch and just gab. May 7, 2010 at 10:13 p.m. I love watching them grow up and learn more things. It is amazing to see them accomplish more and more every day. It is hard for me to wrap my mind around the fact that the small baby that came out of me is now a big boy who can do so much. May 7, 2010 at 10:51 p.m. I love that my mother passed along her love of creating. She taught me how to knit when I was about 7 and it is now my passion. She taught me to give any craft ago because its just fun to learn something new. She was always telling me that a handmade present is always better than a bought present and I have passed on that message to my girls. May 8, 2010 at 12:22 a.m.
My mom always listened to me. And I, in my self-centered passions, growing through college, then through those years of finding out who I wanted to be, and the young years of marriage - I talked a lot. She was my balance. My friend. The bedrock of my life. Now, she doesn't remember who I am. And the only time when I can really connect with her is to sing to her - the old songs. The ones we used to sing on car trips. Those, she remembers. I miss her. May 8, 2010 at 1:17 a.m.
My mom has recently started knitting again, at age 76. She learned in Germany as a child. Even though she has lost most vision in one eye, her hands know the way to make socks from memory. It's something we can share; after seeming to never have anything in common, and I love giving her yarn from my stash! May 8, 2010 at 6:39 p.m. It is the little smiles I see, the innocent eyes starring at me makes it all worth it! May 8, 2010 at 10:54 p.m.
May 8, 2010 at 11:27 p.m.
My mom has shown me what true strength is..she has always been my security blanket and best friend. I love being a mama to my little guy for things I can't even put into words. He's my everything. May 9, 2010 at 1:09 a.m.